Stephen Strasburg hasn’t been called up to the majors yet and somehow he has one of hottest selling baseball card’s via Ebay Auction at the moment. The card in question is one of kind, according to Sports by Brooks, making it special among the hordes of Strasburg memorabilia … should he proceed to have the career he is said to have one day. The initial asking price for the Bowman Chrome Superfractor Stephen Strasburg baseball card was set at $20,000 or best offer. Now, it’s way past that point. 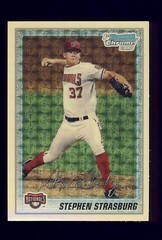 A total of 31 offers were turned down and the card was later relisted as a reserve-auction. And all of this for a young man who hasn’t even pitched one at-bat in major league play.